Check out my Phoenix Photo Album Here! It was kind of weird seeing the Stones in Phoenix, AZ. Arizona is beautiful and I had never been there before, but everything is so spread out. It's definitely not like seeing the Stones in a city like Chicago or San Francisco for example, though I didn't think it would be. E & I had just come off the Oakland show & flew into Phoenix the day before the gig, taking a taxi from the airport (in a surprising amount of rush hour traffic) to the Hilton Tapatio Cliffs Resort in Phoenix. The band was staying in Scottsdale at the Phoenecian, and Cardinal Stadium was in Glendale...so everything was about 40 minutes apart in the traffic. The weather was beautiful, and being from Pittsburgh, it was hot, 90 degrees when we arrived. We checked into our room in the mid-afternoon and then had a few margaritas at the golf club bar before partaking in a better than usual dinner in the restaurant there. My husband Dave was in Chicago seeing Barbra Streisand that evening with his sister and then was flying into Phoenix & renting a car and meeting E & I on show day for the Stones. It was odd not seeing the band during a show day, but we didn't really have time to trek over to their resort, which was even larger than ours. Each resort has multiple bars and restaurants and often you need to travel by car or golf cart to get from one place to another. E & I had lunch at the Mexican restaurant, again better than average food, a ton of it, and a few mango margaritas which were delicious. We left fairly early for the show at Cardinal Stadium, armed with directions, but immediately were stuck in rush hour traffic again. We arrived around 6pm at the stadium & were pleasantly surprised to find FREE parking! 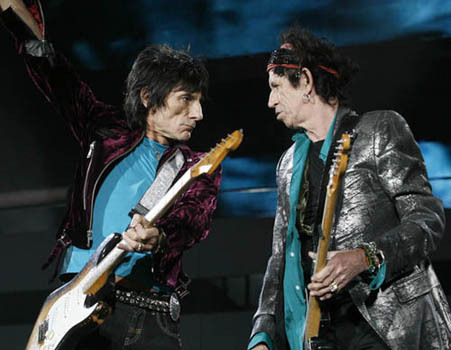 Who ever heard of free parking at a Stones show before? We parked near the Will Call area and then got in line to pick up our tickets. Once collecting our tickets Dave went to the VIP lounge and E & I headed back to the Rattlesnake. We had to wait for some time in the tunnel before Bill could be freed up from the Meet n' Greet, because everyone was running late due to the traffic and due to coming from Scottsdale to Glendale, etc. Including Alice Cooper, whose set was delayed by about 45 minutes. The venue security guy at the Rattlesnake was confused by the passes, as was another venue security guy, and each were allowing people with VIP's inside until we showed them the difference between the passes. They were getting Show passes, which are laminated, but similar shape to VIP passes, confused with each other-duh. Anyway, the delay worked in our benefit, making the Rattlesnake open a bit later than usual. I was able to obtain a third pass for Dave and he later joined us inside the Rattlesnake too. We ended up sitting at a table with some folks who were friends of Alan Dunn's, as well as some folks who were friends of Jo & Ronnie's. Charlie came over to our table and stood directly behind our chairs for sometime, having a conversation. 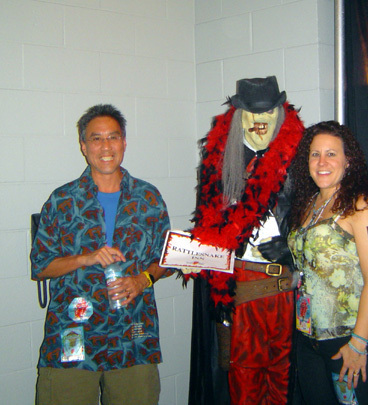 On the way to our seats we stopped and posed for photos with Rattlesnake doorguard, a big Halloween type mannequin. We took our place on the floor, alongside the other 40,000 fans in the stadium and at 9:35pm the bang resounded and out leapt Keith right in front of our faces. I had gotten the setlist from Alan Dunn backstage and so I knew we were in for at least one welcome surprise. Far Away Eyes was the surprise addition and Mick said something to the effect of the desert being like the country or something. Mick's voice sounded good, but the show was not quite as energetic as it had been in Oakland 2 days before. All Down the Line is a surprise for some, but I've heard it quite a few times live. Midnight Rambler is always good, tonight's version running about 12-13 minutes. I think our favorite thing about tonight's show was that Keith spent quite a bit of time playing directly in front of us, he even acknowledged me from the stage. Unfortunately, my camera was messed up and hardly any of the photos turned out in focus that night. Funny enough, I actually had to use the loo really bad by the time Keith's set ended, so I walked back during Under My Thumb & being a new stadium the restroom was close by & not crowded, so I took a few photos of the B stage on my way back to my seat. Easiest "Billy break" (old joke, you had to be there), in a stadium in years. 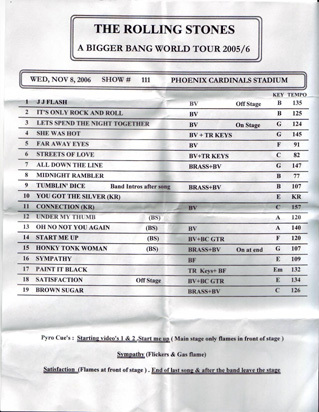 I have only taken a potty break in the middle of a Stones show 3 times in 74 shows, which is why I remember the songs I peed to (hahahahahaha)...my songs were Tumbling Dice in Philly '99, Out of Control in London '99 and now Under My Thumb in Phoenix '06. We only got a 19 song set tonight, and while everyone played well, they didn't have the energy they had in Oakland. Plus, Ronnie's brother had just passed away and that put a damper on things as well. The following day we went to Scottsdale and bought some turquoise jewelry and then on Friday flew to Vegas for the Who & then the Stones on Saturday.